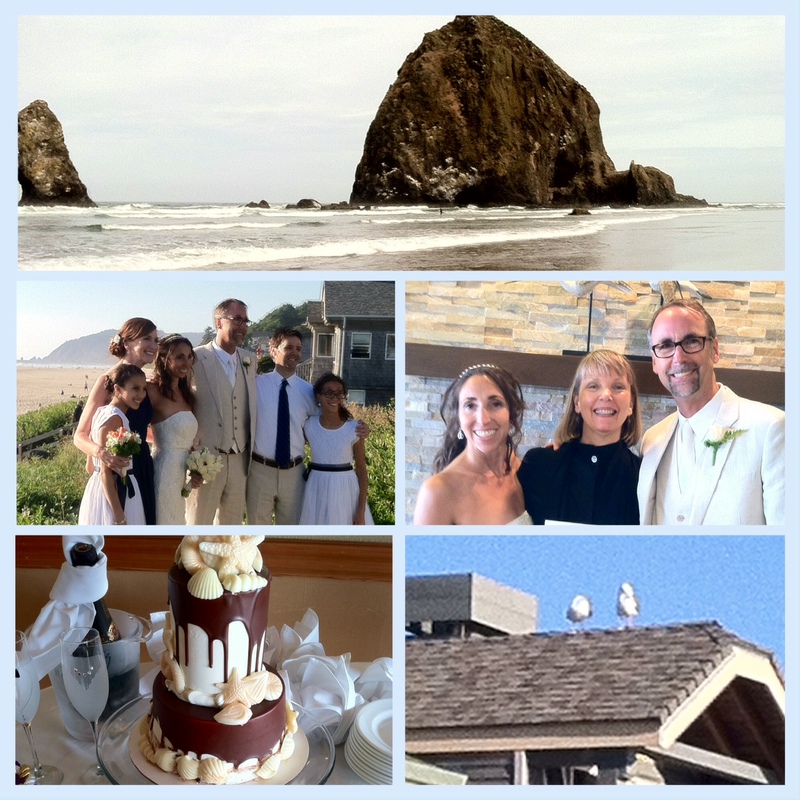 Sunny skies and balmy ocean breezes provided the perfect backdrop for Saturday’s Solstice wedding at The Stephanie Inn in Cannon Beach. The bride was barefoot and beaming as were her attendants: daughters Elena and Sophia and best friend, Nadine (who flew in from Chicago for the weekend). Two unexpected guests arrived just before the ceremony began – a pair of seagulls who perched on the rooftop of the Inn and remained until the vows had been exchanged. Champagne and chocolate mousse cake awaited guests in the library following the seashore nuptials. (An extra treat was provided when the groom and best man brought out their guitars for a family sing along.) Next on the agenda: a gourmet dinner in the Stephanie Inn Dining Room featuring wild caught Oregon salmon and Alaskan halibut. The festive day was crowned by a bonfire on the beach complete with guitar music, a blanket of stars and s’mores. A delicious brunch on Sunday allowed for more laughter and hugs before checkout time. The newlyweds will host a reception in Portland and honeymoon in Peru before returning to their home in Phoenix. Congratulations, Dianna and Peter. May the light and joy of your wedding day remain in your hearts always!